Welcome to the tutorial on installing a Romanian Threaded Front Sight Block. Ok before we begin, I have to give a disclaimer; this tutorial is based on a "theory" on how to do it. Other people have followed this method and it works, but I personally have never done this before. So if some thing goes wrong don't blame me. UPDATE: K-VAR is out of Romanian Threaded Front Sight Blocks. The only other place you might find them is on one of the auction sites. Please do not email me asking, I get this question all the time. And NO the Bulgarian threaded blocks will not work because the thread size can accept flash hiders unlike the Romanian one which can not. Before we replace the Front Sight Block I must mention a few things. 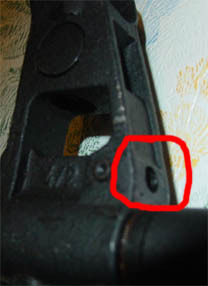 Because of a cool technicality in the law you can put a Romanian Threaded Sight Block on a SAR-2 rifle because of its odd thread size. This is legal because the threads are on the sight block, not the barrel, and the fact that it is threaded with 22mm threads, which currently there are no sound suppressors, or flash suppressors designed with that thread size. Here is a link to the BATF ruling that this is legal. Now with a threaded Sight Block on a SAR-2 (sorry but they only fit 5.45*39mm AKs with out modifications,(.223 AKs might work but I am not sure), though I have heard that 7.62 versions exist) you can use a Romanian Muzzle Brake that is threaded in 22mm. With a threaded muzzle brake you can take it of and put it on whenever you want to, now welding in place! The only thing you have to watch out for is your US parts count. With a foreign muzzle brake attached you have to replace at least one more foreign part on your rifle with one made in the US. Ok now that that's out of the way we can begin. 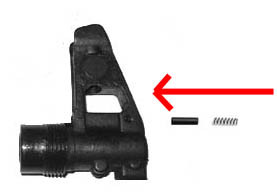 First below is a list of parts you must have to install a Romanian Threaded Front Sight Base. Ok first you must remove your old Front Sight Block. To do this you must remove the two bottom pins that hold the Front Sight Block on. To learn how to do this visit the Fixing a Canted Front Sight Block tutorial which can be found on the menu to the left. Once the pins have been removed return back to this tutorial. Also another option to removing the pins is to just cut the old front sight block off with a dremel. I don't recommend you do this but it will work, just be sure not to cut your barrel in the process. With the pins now removed make sure you scribe on the barrel the locations it is at. Take your hammer and tap the front sight block off, that is if you didn't cut it off already. With the old front sight block removed, take a little bit of your lubricant and lightly coat the front of the barrel up to the part where your new front sight block will go. Now your ready to install the Threaded Front Sight Block onto the rifle, first slide it onto the barrel and lightly tap it into place with a hammer until its in the same position that you scribed on the barrel where your original front sight block was. Be very careful not to mess up the threads with the hammer. When you have it where you want it, lay the rifle on either side and get some one or some thing to hold the front sight block exactly where you want it. Take your drill and install the 1/8th drill bit. Drill out the two original holes to 1/8th. Now take your 1/8th diameter steel pin and cut off two pieces .50 inches in length. Put a tiny bit lubricant down the re-drilled holes. Grab your hammer and lightly tap the piece into the drilled holes. Once they get close enough to the bottom of the rifle base use your pin punch to finish the job. Next take a look at the threaded front sight block and look at it from the rear; you will notice that there is a hole above where the barrel fits. This hole is for the Retainer pin that locks the compensator in place, but it's missing so we must put it together. The rear hole is where you insert all the parts from, the front hole is where the plunger comes out. 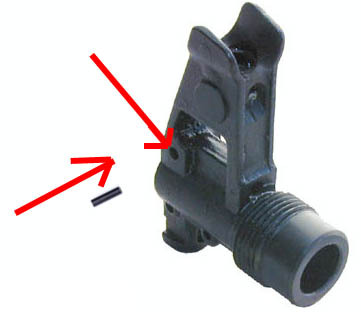 Take the spring and retainer pin that came with package AK205 that you ordered from K-VAR and drop the retainer pin, with the open end facing to towards the rear of the front sight block down into the hole, now drop the spring down inside the hole also. View the picture if you need help. 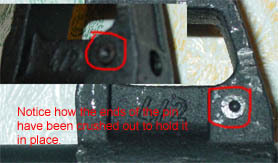 Next we need to lock the piece in place, take part number AK256 that you ordered from K-VAR and put it in the small hole circled, use a small punch to put it in place, you may have to use another punch to push the spring out of the way, make sure that the compensator retaining pin and spring are still inside the front sight block. When the pin is in place push in on the compensator retainer pin, if you did this correctly it should have some spring tension behind it. The ends of part number AK256 should be cupped out to hold itself in place, to secure it we must flatten both ends on each side. Look at the picture below. To flatten the ends of the pin out you must place one side of the pin against a flat hard metal object and tap of the opposite side with a pin punch to get it to flatten out, when you are finished on one side switch sides and do the other. View thepicture to get an idea of what it should look like. And lastly, take a dremel, or file and grind off the Bayonet lugs if your threaded front sight base has them. You must do this to be legal. And that's it, Reassemble your rifle, put the compensator on, yand your ready to go.